This is part one of a series. Part two can be read here. Part three, here. As I sit down to write this post, it is Tuesday, February 19, 2013, otherwise known as the seventh day of Lent. Every year around this time several blog posts are trotted out for or against observing Lent and arguing for or against various Lenten practices. I believe these kinds of discussions are good and helpful, especially within the neighborhood of Christendom where I reside: the broader Reformed and post-Evangelical world. The reason is that we, if I may lump us together, have been recently rediscovering many of the older practices of the church. Along with that we are also trying to keep our Protestant and Reformed bona fides by discussing which ancient practices of the Church ought to be retained and the way in which we ought to retain them. This post is a part of that ongoing discussion. In it I want to put forth a certain argument for the practice of Lent by way of exploring its history. As I am a credentialed historical theologian, this is both my specialty and my passion. Therefore in this post I would like to explore the content of one meta-question: What are the historical origins of Lent – how far back does the observance of Lent go, and what, if anything, can we say about ancient Lenten practices? This question is important, because the common perception is that Lent is some kind of medieval catholic practice. Now, as a medievalist myself, if it were a medieval development that would not necessarily disqualify it in my book. Yet as we look at the primary sources what we find is that the season of Lent has very ancient origins in the Christian church, almost as ancient as the origins of the church itself and her New Testament scriptures. While this may seem like a fantastic claim, I am confident it can be substantiated. Let me begin with one prominent example. St. Athanasius (c. 297-373 AD) is an early church father who is held in high regard by all Christians, including Protestants. There are two main reasons for this respect. First of all, Athanasius is considered to be the champion of Nicene orthodoxy against the early heresy of Arianism, which taught that Jesus was not God but the highest of all created beings. Athanasius was present at the Council of Nicaea (from which we have been bequeathed the ancient and venerable Nicene Creed), and he continued to fight for the orthodox view of the Trinity and the deity of Christ throughout his life, suffering much on account of the faith including two separate exiles from his pastoral see. 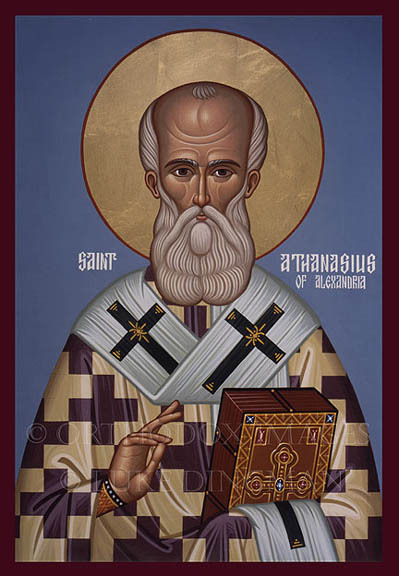 The second reason Protestants revere Athanasius is because of his famous 39th Festal Letter written to his parishioners in Alexandria in the year 367. Now, this letter is precious to Protestants, and especially ones of Reformed persuasion, because in this letter is the first articulation of the entire New Testament canon that we now possess. For this reason, Athanasius is known to some as the Father of the Biblical Canon. We begin the fast of forty days on the 13th of the month Phamenoth (Mar. 9). After we have given ourselves to fasting in continued succession, let us begin the holy Paschal week on the 18th of the month Pharmuthi (April 13). Then resting on the 23rd of the same month Pharmuthi (April 18), and keeping the feast afterwards on the first of the week, on the 24th (April 19), let us add to these the seven weeks of the great Pentecost, wholly rejoicing and exulting in Christ Jesus our Lord, through Whom to the Father be glory and dominion in the Holy Ghost, for ever and ever. Given this evidence, if one was so inclined one might make the argument that the observance of Lent was older than the biblical canon. While I personally would not go so far as to make this particular argument, I would point out that those who lay claim to Athanasius and his Festal letter as proof for the biblical canon might also take a look at an earlier letter of his that shows his support for keeping the 40 day fast of Lent. I would also make a similar observation to those who hold Athanasius in such high regard due to his championing of Nicene Orthodoxy. We may note that the Council of Nicaea met in the year 325 and that this letter followed only five years later. Again, one could make the argument that the observance of Lent is just as old as Nicene Orthodoxy, but, well, I think you get my point. While this quotation is a significant piece of historical evidence, we have to be careful not to overstate its reach. Though this quote reveals to us Athanasius’ desire for a 40 day fast preceding Easter we also find from later letters that this was a change of practice in Alexandria that he was attempting to introduce there. Yet from other sources, including his letter to Bishop Serapion, we find that at least by 340 AD the practice was more widespread and that Athanasius likely received it from Rome. So it seems that it is safe to say that the by the early to mid 4th century, the practice of observing a 40 day fast in preparation for Easter was becoming the norm. Furthermore, I would like to point out that while the Council of Nicaea did not declare a 40 day fast for Lent, it did acknowledge the existence of a 40 day preparatory liturgical season preceding Easter when it declared that local synods should meet twice a year, “One before Lent (Greek: tessarakosta; Latin: quadragesima; literally: 40 days), so that all pettiness being set aside, the gift offered to God may be unblemished,” (Canon 5). This piece of evidence seems significant, because it confirms that Athanasius’ practice was not isolated in 330AD. If the Nicene Fathers referred to Lent in their deliberations, it must have been a pretty widely accepted practice. While we can trace the observance of a 40 day lent to the mid 4th century, the setting aside of some time of preparation in advance of Easter is still at least one century more ancient. In several sources, including the Didascalia Apostolorum, The Apostolic Tradition, and a Festal Letter by Dionysius of Alexandria, we find that there was a one, two, or six day preparatory fast leading up to Easter, depending on the time and location. This, according to scholar Thomas J. Talley, places the practice of preparatory fasting as early as the first half of the third century (200-250 AD). It seems that this six day preparatory fast has become our modern Holy Week, and that by the 4th century this period was extended to 40 days to symbolize the fasts of Jesus, Moses, and Elijah. In conclusion, what are we to take away from this historical evidence? I argue that we should take from it that Lent is a very ancient and universal practice of the Christian Church. Evidence for it is as ancient as evidence for the biblical canon and our most important statement of Trinitarian orthodoxy. Nevertheless, I am not arguing that keeping Lent is as important as the canon of the New Testament or the belief in the Trinity, and neither am I arguing that Lent is as old as these things. This is because Athanasius’ 39th Festal letter is not the origin of the biblical canon. This concept existed far before the year 367 and was held, evidently, by the first Christian disciples of the 1st century. Likewise, neither was the Trinity invented at the council of Nicaea. Trinitarian belief was a part of the Christian faith from it’s earliest days after the resurrection of Jesus. Therefore, while the observance of Lent is not as ancient and venerable as two of the pillars of our faith, the biblical canon and the Nicene Creed, it is regardless a very ancient and very respectable practice, as old as one of the earliest major proponents of these two pillars, Athanasius of Alexandria. But I have further deemed it highly necessary and very urgent to make known to you that you should proclaim the fast of forty days to the brethren, and persuade them to fast; to the end that, while all the world is fasting, we who are in Egypt should not become a laughing-stock, as the only people who do not fast, but take our pleasure in those days… But, O, our beloved, whether in this way or any other, exhort and teach them to fast forty days. For it is even a disgrace that when all the world does this, those alone who are in Egypt, instead of fasting, should find their pleasure. Sources: The Origins of the Liturgical Year, by Thomas J. Talley; The Second Festal Letter of Athanasius, accessed here; The 39th Festal Letter of Athanasius, accessed here; Athanasius’ April 340 letter to Serapion found in Les lettres festales de saint Athanase, edited by L. Lefort, pp 654-656; The Canons of the Council of Nicaea, in Decrees of the Ecumenical Councils by Norman P. Tanner. This Sunday at Christ Our King we will be confessing the Athanasian Creed. It is a very long creed, and because of its length the modern church does not confess it much any more. Yet it seems like a good practice to confess this creed at least once a year, on Trinity Sunday. The reason is that the Athanasian Creed is a more detailed, robust, and instructive statement of both the deity and humanity of Christ and the mystery of the Trinity than the Nicene Creed is. It will be good to stretch our theological muscles in this way. The Athanasian Creed is named for St. Athanasius, a 4th century theologian and churchman who dillgently defended the orthodox faith concerning the Trinity and the deity of Christ against the rising tide of Arianism. At times it seemed to Athanasius as if he was completely alone in defending the truth. Because of this the slogan, Athanasius contra mundum (Athanasius against the world) became to be associated with him. Athanasius is also important because his Easter Letter of 367 is the first written witness to the entire New Testament Canon. But Athanasius did not write the Athanasian Creed. It was attributed to him and was thought to have been written by him up unto the time of the Reformation. Yet we still refer to the creed as Athanasian because it expresses the ideas that the bishop fought for during his life. The author of this creed is still unknown. It is a Western Creed that has been confessed in the churches going back until at least the sixth century. We will confess it this Sunday, on the Day of the Holy Trinity, because it contains a robust confession of the doctrine of the Trinity as we profess it in catholic churches. The creed is also very instructive, as it lays out many of the nuances of Trinitarian doctrine. Though it is a very long creed, it will be helpful to at least once a year stretch ourselves to profess the doctrine of the Trinity in this way. Whosoever will be saved, before all things it is necessary that he hold the catholic faith. Which faith unless any person keeps whole and undefiled; without doubt he shall perish everlastingly. And the catholic faith is this: That we worship one God in Trinity, and Trinity in Unity; Neither combining the Persons; nor dividing the Essence. For there is one Person of the Father; another of the Son; and another of the Holy Spirit. But the Godhead of the Father, of the Son, and of the Holy Spirit, is all one; the Glory equal, the Majesty coeternal. Such as the Father is; such is the Son; and such is the Holy Spirit. The Father uncreated; the Son uncreated; and the Holy Spirit uncreated. The Father unlimited; the Son unlimited; and the Holy Spirit unlimited. The Father eternal; the Son eternal; and the Holy Spirit eternal. And yet they are not three eternals; but one eternal. As also there are not three uncreated; nor three infinites, but one uncreated; and one infinite. So likewise the Father is Almighty; the Son Almighty; and the Holy Spirit Almighty. And yet they are not three Almighties; but one Almighty. So the Father is God; the Son is God; and the Holy Spirit is God. And yet they are not three Gods; but one God. So likewise the Father is Lord; the Son Lord; and the Holy Spirit Lord. And yet not three Lords; but one Lord. For like as we are compelled by Christian truth; to acknowledge every Person by himself to be God and Lord; So are we forbidden by the catholic religion; to say, There are three Gods, or three Lords. The Father is made of none; neither created, nor begotten. The Son is of the Father alone; not made, nor created; but begotten. The Holy Spirit is of the Father and of the Son; neither made, nor created, nor begotten; but proceeding. So there is one Father, not three Fathers; one Son, not three Sons; one Holy Spirit, not three Holy Spirits. And in this Trinity none is before, or after another; none is greater, or less than another. But the whole three Persons are coeternal, and coequal. So that in all things, as aforesaid; the Unity in Trinity, and the Trinity in Unity, is to be worshipped. He therefore that will be saved, let him thus think of the Trinity. Furthermore it is necessary to everlasting salvation; that he also believe faithfully the Incarnation of our Lord Jesus Christ. For the right Faith is, that we believe and confess; that our Lord Jesus Christ, the Son of God, is God and Man; God, of the Essence of the Father; begotten before the worlds; and Man, of the Essence of his Mother, born in the world. Perfect God; and perfect Man, of a reasonable soul and human flesh subsisting. Equal to the Father, as touching his Godhead; and inferior to the Father as touching his Manhood. Who although he is God and Man; yet he is not two, but one Christ. One; not by conversion of the Godhead into flesh; but by assumption of the Manhood by God. One altogether; not by confusion of Essence; but by unity of Person. For as the reasonable soul and flesh is one man; so God and Man is one Christ; Who suffered for our salvation; descended into hell; rose again the third day from the dead. He ascended into heaven, he sits on the right hand of the God the Father Almighty, from whence he will come to judge the quick and the dead. At whose coming all men will rise again with their bodies; And shall give account for their own works. And they that have done good shall go into life everlasting; and they that have done evil, into everlasting fire. This is the catholic faith; which except a man believe truly and firmly, he cannot be saved.